In my quest for increased productivity and focus I came across a time-boxing technique called Pomodoro. 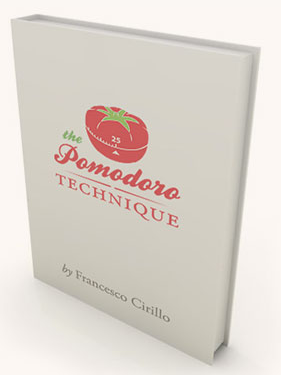 A short free book describing the application of the practice in detail can be found on the Pomodoro web site, but for now I'm employing a simplified version to see what time-boxing feels like and how it affects my general productivity and focus. Perhaps I will return to the book and the system to begin applying more of the described methodology for managing time once I see how my initials trials with time-boxing go. The idea of time-boxing while I'm working on things within my sprint, seems like a good pairing and smells of agile spirit. Becoming. An abstract, dimensional aspect of time, which gives rise to the habit of measuring time (seconds, minutes, hours); the idea of representing time on an axis, as we would spatial dimensions; the concept of the duration of an event (the distance between two points on the temporal axis); the idea of being late (once again the distance between two points on the temporal axis). The succession of events. A concrete aspect of temporal order: we wake up, we take a shower, we have breakfast, we study, we have lunch, we have a nap, we play, we eat, and we go to bed. Children come to have this notion of time before they develop the idea of abstract time which passes regardless of the events that take place (16). Of these two aspects, it is becoming that generates anxiety – it is, by nature, elusive, indefinite, infinite: time passes, slips away, moves toward the future. If we try to measure ourselves against the passage of time, we feel inadequate, oppressed, enslaved, defeated, more and more with every second that goes by. The succession of events, instead, seems to be the less anxiety-ridden aspect of time. At times it may even represent the regular succession of activity, a calm-inducing rhythm. A different way of seeing time (no longer focused on the concept of becoming) alleviates anxiety and in doing so leads to enhanced personal effectiveness. Better use of the mind enables us to achieve greater clarity of thought, higher consciousness, and sharper focus, all the while facilitating learning. Employing easy-to-use, unobtrusive tools reduces the complexity of applying the Technique while favoring continuity, and allows you to concentrate your efforts on the activities you want to accomplish. Many time management techniques fail because they subject the people who use them to a higher level of added complexity with respect to the intrinsic complexity of the task at hand. FYI - The technique is not suggested to be used during your free time! Here is how I setup my first Pomodoro. The screen shot below shows my desktop, with dual monitors, taskbar on the far left and vertical, The two right-most windows in Eclipse are on the right monitor and the other 4 windows on the left are on the left monitor. Notice how I'm using Eclipse internal web browser to display the Pomodoro countdown, which says "time expired". I tried out a few different ways of using a timer, kitchen timer, iPhone, etc..., but what I've found works best for me is to use the E.ggTimer web site and keep it open in a sliver of my screen space. I like the use of the Egg Timer, as it has an non-intrusive countdown and also makes an audible alert, which I can hear while I'm listening to Pandora. I thought my smartphone might make a good timer, but the screen kept shutting off and it really didn't appeal to me as much as having the Pomodoro on-screen. The E.ggTimer site also offers a pomodoro timer, which is setup for a 25 minute Pomodoro with a 5 minute break. I've not had much practice with the technique yet, but there is something different about working and seeing the countdown of the Pomodoro timer, that gave me a heightened sense of focus. I was definitely more aware of the many distractions I have, even though I thought I was doing well with minimizing distractions and avoiding task switching. This technique really puts anything that distracts you in your face, you should make quick note of it, if it is important and continue with the work at hand. It will be interesting to see the effects of this practice over a few weeks and whether I make the determination to stick with it.